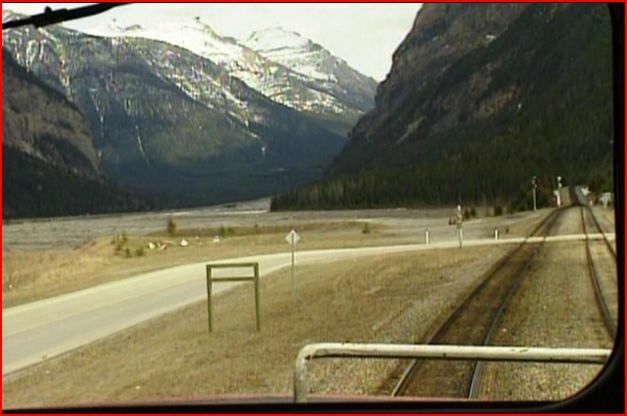 Locations: Kicking Horse Pass, Field to Lake Louise, Canadian Pacific trackage. This volume is from a different viewpoint, than the other 3 in the series. 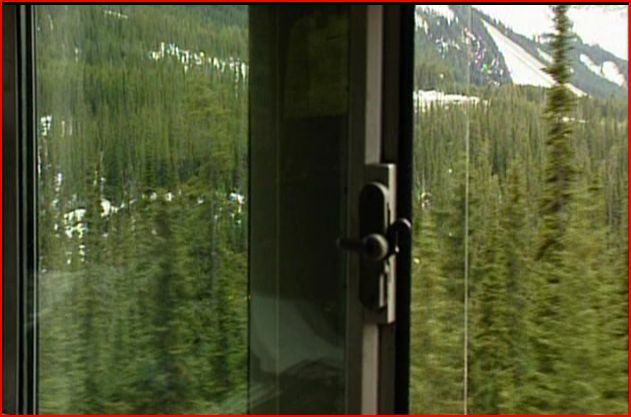 The other programs have the fantastic exterior train and scenery views. This one has the camera inside of the locomotive. Isn’t this the best way to cross the Continental Divide? Canadian Pacific SD40-2F will be our chariot. A 3000 horsepower diesel in the lead of a 9000 total horsepower lash-up. Two additional SD40’s. 45 loads and 23 empties are going to travel up the 2% mountain grade. That is a full on, piece of heavy mainline grade. 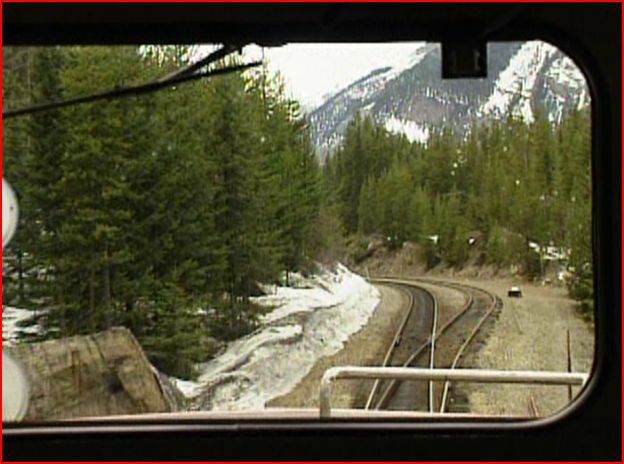 As much fun as it is, to watch trains cross the Canadian Rockies, the cab provides a totally different viewpoint. We begin at Field, the mountains looming high in the sky. A green target aspect gives us a clear block, and we are off! This is a single track main. The radio crackles, the diesels start to growl. We are on our way. CP Rail #9020 is a Canadian SD40 version. It has the wide cab, locotrol equipped and ditch lights. Yes, those lights were a Canuck innovation, adopted by US roads. Riding with the Canadian Pacific engineer, we will learn about locotrol, and more! 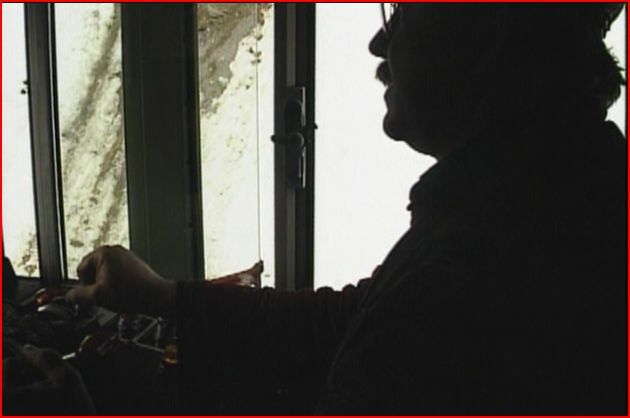 You will see the man needs to concentrate on getting the freight; upwards and safely through the mountainous trackage. The downhill is equally challenging, that’s major tonnage to control. Watching the engineer work the controls of the locomotive is a rare treat. The camera is usually facing forward. Sometimes it is movable, as well. This is what the best cab rides will contain. Everyone wants to see the engineer work his controls, steam or diesel. Smart cinematographers will pan the camera, just like moving your head. Sometimes, and rarely, a stiff forward only, mounted view can work. In a beautiful mountain region, it is nice to take in a few sights along the way. The ride will cover 20 miles. Field to Lake Louise. A route map is helpful. It can be surprising, how much curvature we encounter. Solid rockface and a forest of large pines surround the train. The cab windows are open. Looks like a nice day, in the early spring. Not much snow on the lower elevations. The only green is from the evergreens. Mostly brown or gray, where there isn’t any snow left. The engine is fairly loud, even in the cab. The crew talks back and forth a bit. It is hard to make out the conversations. A part of that is the volume of the engines. The microphone is also problematic, to hear these men. If they turn and speak at the camera, it is fine. Doesn’t the bell sound strange? More like a mechanical thud from the inside of the cab. Greg Scholl has explained to me about the cab audio. Much of it revolves around where the camera, and microphone could be setup. The microphone is actually pointing forward, with the forward facing camera. Inside the cab and outside do sound different. Audio compression technology, circa 1992 also has a part in the final results. Great effort goes into getting the footage on some shows. This required extra effort, and a bit of luck to even get the ride. In fairness, the man did his best. Audio editing was also very costly. Money spent, to make what dialogue is heard, socially acceptable language. Narration is very minimal on this show. The narrator is much louder than the rest of the audio soundtrack. It’s good that he can be clearly heard. However, if you have the volume up loud, to listen to the crew, the narrator will roar at that volume. Seems like some additional narrative would have worked out fine. The camera pans to include many different views. Check the interior of the concrete snowshed. 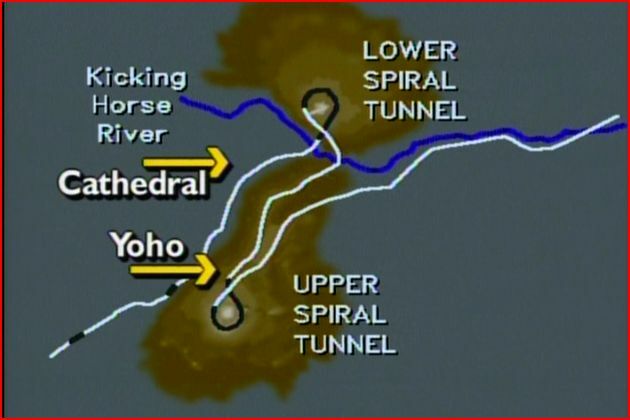 Compare this to the old, interiors of the spiral tunnels, later on the trip. Please, no whining about a few specks on the windshield. This is a working train, on a normal workday. It is a pretty clean windshield, for starters. Just remember, this is as authentic as it gets. Yes, the windshield does acquire more ‘character’ as we progress. The scenery has spectacular sights. There is snow up on the mountains. Just enough to add that Canadian flavor to the Rockies. Looks like the last remainders of winter. Higher peaks have greater snow cover. At Banff, the distant snow capped mountains are dramatic looking. 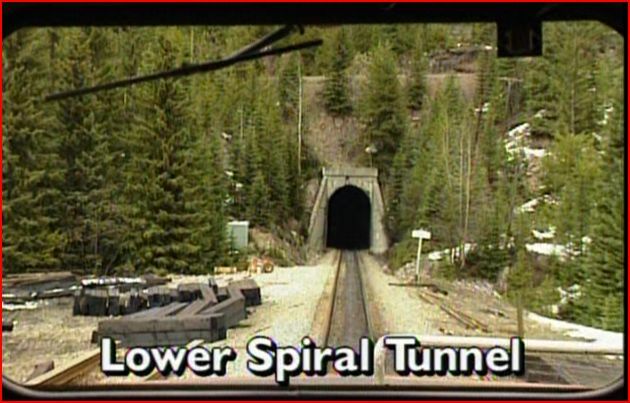 The spiral tunnels are an engineering feat of railroading. The journey through them is great! By the way, CP Rail had equipment at the ready, to widen these tunnels for double stack traffic. The tunnels were going out of service after this train passed. So, some of these views, or perhaps all, are the last look at the originals. Higher up in Kicking Horse Pass, there is quite a bit more snow on the ground. A map informs of our position on the route. Ever wonder what happens if a locomotive overheats on a mountain? You’ll find out. Engineer Don Nadasde, does a great instructional segment on the locomotive controls and readouts. He also explains the locotrol on this CPR GM30 YD. That is for mid-train helper controls. 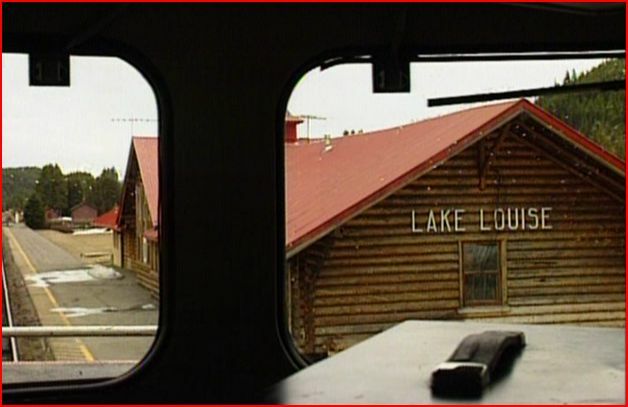 We arrive at Lake Louise, and the former Canadian Pacific station. This is a really good cab ride, over a super scenic route. Would have been nice to hear the crew chat clearly. The overall program is very well done. 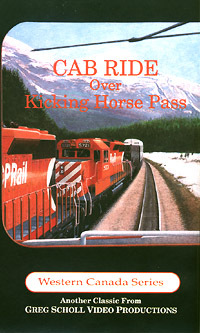 A nice companion show to the Greg Scholl- CP’s Kicking Horse Pass. Railfans should find this an interesting show. 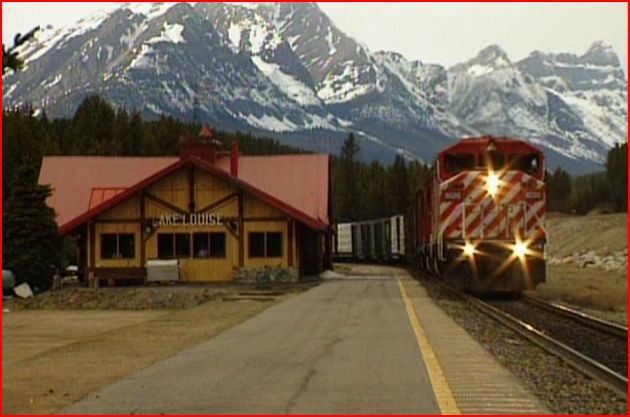 This entry was posted in ATVR Reviews, Greg Scholl and tagged American Train Video Reviews, Canada, Railroad, Train DVD by William J. Hudson. Bookmark the permalink.